HE will be one of the youngest TDs in the new Dail, and Fianna Fail's Jack Chambers had a baptism of fire online last night. FAI boss John Delaney may have canvassed for his pal, Labour’s Alan Kelly, but he was voting in a different election altogether yesterday. He may be off the airwaves due to the broadcasting moratorium but comedian Oliver Callan is claiming an election victory of his own. We've all fallen into the old trap of spotting a face off the telly and thinking we knew them in real life. Taoiseach Enda Kenny has been shaking a lot of hands over the past three weeks, including some very recognisable faces. Meath farmer 'Eugene' wants to give Fine Gael Meath East candidate Helen McEntee (right) "an earful" on the state of GAA in the Royal County. If things go to plan for Averil Power, she’ll be boxing her way to electoral success this Friday. The Floating Voter Podcast 9: Whinging whingers, poll overload and a Joan Burton revival? With all the opinion polls finally out of the way all that’s left now is the real voting. We've had our fair share of music videos during this General Election campaign, including one or two belters from Kerry. Mattie McGrath, dancing, in a pair of boxing gloves with his Tipperary opponents' names on them. Have we reached peak election video? Mayo has trouble winning All Ireland's - unless it comes to whingers, Taoiseach Enda Kenny has said. Comedian Oliver Callan has claimed victory in the ratings war battle between the various "Leaders" debates. There was one question on the lips of reporters at Sinn Féin deputy leader Mary Lou McDonald's press conference - who was the mystery man who hijacked the whole thing? Strained harmonies? Check. Cheesy lines? Check. Michael Healy-Rae pictured with a gun? Check. With a hung Dáil now on the horizon it’s time for Floating Voters to make their minds up. Former Lord Mayor of Dublin Christy Burke is the latest candidate to land a celebrity endorsement - singer Christy Dignam of Aslan. A Fine Gael TD stormed out of a conference after being confronted and heckled during a discussion on the prevention of the establishment of windfarms. Could 'No Direction' be the next big thing? The Labour party tapped into popular music culture for their latest campaign for the upcoming general election. 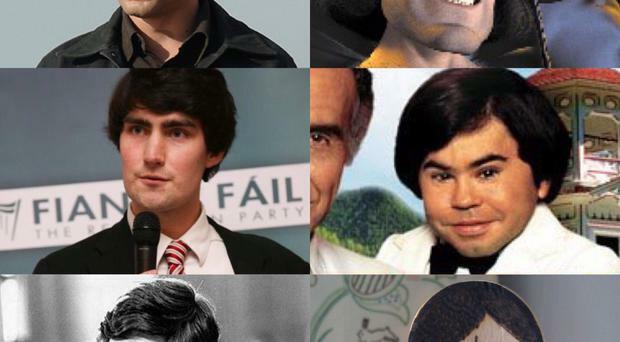 A video has gone viral of an Irish lad's impersonation of the General Election candidates. It's dog-eat-dog out there on the campaign trail - or if you're Fine Gael's Michael Ring, dog-eat-candidate. What is the actual choice facing voters on Fri 26th February? It was surely the coldest day on the hustings yet with the mercury down to minus 3. A set of twins were this morning named after the Taoiseach and Minister for Agriculture. With one election debate out of the way and the campaign well underway there is plenty for the team to discuss on today’s Floating Voter. Floating voter day 9: A Healy-Rae in headphones - what fresh horror is this? It is wacky, wiggy and won't win any Oscars, but Martin Heydon's 'Back to the Future'-inspired election video has Generation Facebook's vote anyway. One young man saw his opportunity. Here was the most powerful politician in the country. It was wide open and he went for it. EVERYONE knows DeLorean can't time travel unless it hits 88mph. On the campaign trail: GAA and politics often go hand- in-hand - and there's no better true GAA heartland than Co Limerick. The latest hilarious election video features a Kildare TD channeling his inner Marty McFly. Sinn Fein leader Gerry Adams took a break from canvassing today to enjoy a dance with one of his party's candidates, Rose Conway-Walsh. As politicians lecture each other about fiscal responsibility on the campaign trail, it has emerged that several incumbents of Leinster House have had trouble keeping on top of their own bar bills. As Storm Imogen battered the country, some hardy candidates were still out and about hitting the doors – the nutjobs. The Irish politician that most people would like to date this Valentine's Day has been revealed. The late hunger striker Bobby Sands is revered in Sinn Féin so a typo in Mary Lou McDonald's election leaflet will leave her team particularly red-faced.